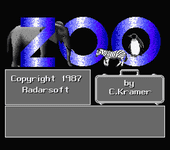 Zoo is a Dutch adventure game published by Radarsoft for the MSX in 1987. You have to solve a crime moving in and around a zoo park. Use the joystick or a mouse to move around and pick up items to put in your trunk. But you can only take a few items with you and some items are useless. So be prepared to move back and forth a lot.